How Can I Use Roll Up Curtains to Create a Comfortable Outdoor Space? Outdoor seating is a must-have in many situations. When the weather is warm, why not utilize your restaurant’s extra seating space or your home’s stylish patio? However, in some situations, having your seating area open and exposed to the air can present a few problems. 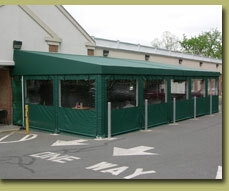 Luckily, Carroll Awning Company’s custom roll up curtains can be the solution. If you are a business owner who needs to make use of any extra seating to help with crowd overflow, than an outdoor seating area is key. But what if it rains, or is unseasonably cool out? What if a strong wind kicks up? Using roll up curtains that can be customized to be rolled by hand, by pulleys, or motorized, can block out the elements while still providing natural light to your customers; this way, they’re saved from a soaking and you’re saved on seating space! Roll up curtains are also essential at closing time. Rather than having to drag in and store dozens of chairs and tables, rolling down your curtains will keep your property secure and keep you from having to spend time after hours and again in the morning setting up your outdoor seating area. At home, a residential awning can be spruced up with the addition of roll up curtains, and they provide many of the same benefits as commercial ones do. Keep your family barbeque cozy and dry even if a summer drizzle starts, and secure your patio furniture without taking up room in the storage shed.